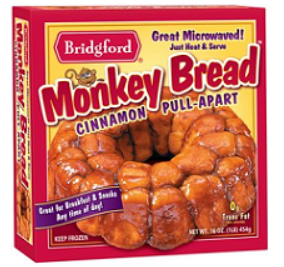 Steward of Savings : $0.75/1 Bridgford Rolls, Bread Dough or Monkey Bread Coupon! ONLY $2.23 at Walmart! $0.75/1 Bridgford Rolls, Bread Dough or Monkey Bread Coupon! ONLY $2.23 at Walmart! Go here to print>> $0.75/1 Bridgford Frozen Rolls, Bread Dough or Monkey Bread Coupon! USE (1) $0.75/1 Bridgford Frozen Rolls, Bread Dough or Monkey Bread Coupon! FREE Lipton Tea Wellbeing Tea Sample Pack! FREE YQ by Yoplait Yogurt Cup at Stop & Shop! FREE $10 Amazon Gift Card from My Coke Rewards! FREE La Roche-Posay Anthelios Sunscreen Sample! FREE Mariani Walnutmilk at Stop & Shop! FREE Orgain Organic Kids O-Bar Sample Pack! FREE Merci European Chocolate Candy Sample Box! FREE Impossible Burger at Dave & Buster's! Hormel Pepperoni, ONLY $0.50 each at Dollar Tree! FREE Kellogg's Family Rewards Points Code! Maurices: $10 off ANY $10 Purchase Coupon! FREE Roger & Gallet Extrait De Cologne Sample! FREE Lysol or Air Wick Products from ViewPoints! FREE Breathe Right Advanced Strips Sample Pack! FREE Keys Made at minuteKEY Kiosks! FREE T-REX Ferociously Strong Duct Tape Sample!